Mid Life Cyclist: A Tale of Two Cities! Within the space of a week I was to see the good and the bad of what America could offer by the way of two very diverse towns! 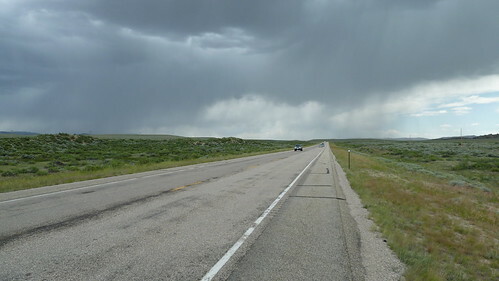 Guffey in Colorado and Jeffrey City in Wyoming. Let me start with the good, Guffey. Guffey is one mile off the Trans Am route at 8600 feet, but worth the short steep diversion into the top of the caldera where this small community is based. Your greeted by a big new bar on the left as you arrive, “The Bull Moose” and an older locals bar The Freshwater Salon, just a block away, both offering good beers, food and full of Stetson wearing friendly locals. 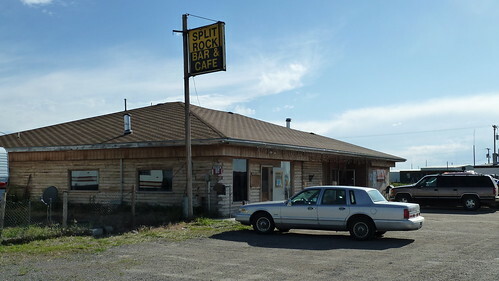 There is also Rita’s Place Cafe, a post office and library; but the place to head for is the Guffey Garage and track down Bill Soux, a real character and a great bloke. After shaking your hand bill will promptly plant a cold beer in it and precede to tell you all about Guffey. Bill has been instrumental in restoring Guffey’s heritage, mainly it’s rustic cabins which date from the 1880’s and if your planning to stay a night in Guffey Bill will rent you a rustic cabin at a cheap price. 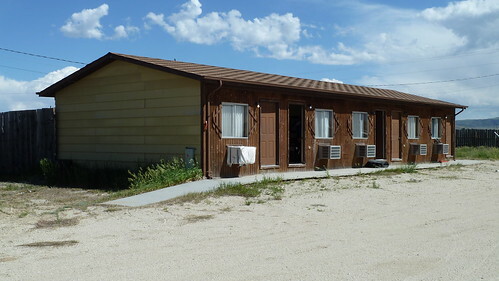 Our cabin was the towns original assay office called the Chow Hall, a basic bunk house with gas lights, an outdoor toilet and a shower down the road at another cabin. Some of the cabins come with a TV/VCR and old black and white western videos. Not the Ritz by any means, but for $12 this piece of gold rush history was ours for the night, although we did also share it with Dan who rolled in later after sharing a large herbal cigarette with Bill!! Bill can usually be found at his garage, which in itself is a museum of oddities with Bill either building hot rods or signs and tourist gifts out of horse shoes, the bright arc light from his welder lighting up the inside of the dimsy shed. Guffey is also semi-famous for electing animals Mayor of Guffey, although such an office does not officially exist. 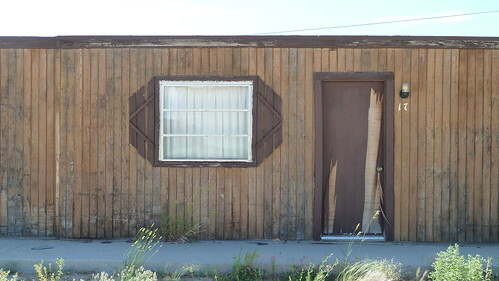 According to local folklore, the two main political parties in Guffey are called the "Democats" and the "Repuplicans". The last known Mayor of Guffey is a cat named Monster (elected in 1998). I caught sight of Monster creeping around outside Bill’s garage, he didn’t seem to be wearing any mayororial cloak or chains of office, probably a hindrance when hunting for gofers! 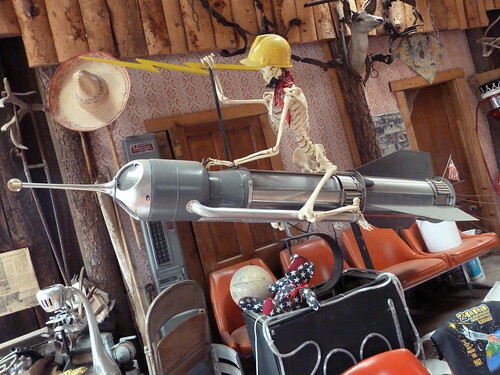 She showed us round the Town Hall which acts as a museum and as with the rest of the town contains an eclectic mix of the weird and the wonderful including a skeleton riding a rocket! 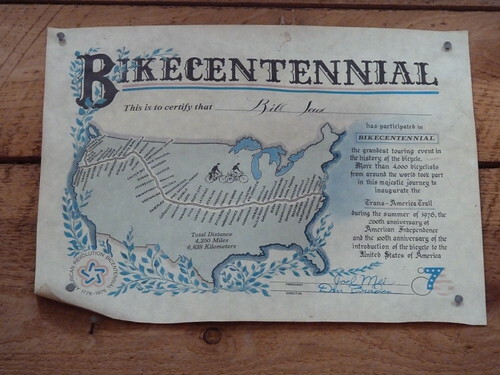 Their is also a Bikecentennial certificate on the wall awarded to Bill for providing accommodation for the many cyclists that made the initial cycle across America back in 1976. 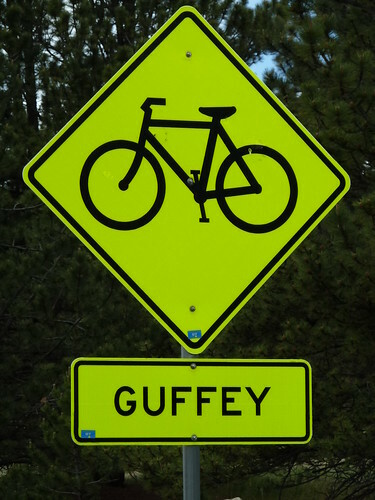 I ensure that any East bound cyclist I meet always gets the “don’t forget to go the Guffey” pitch. 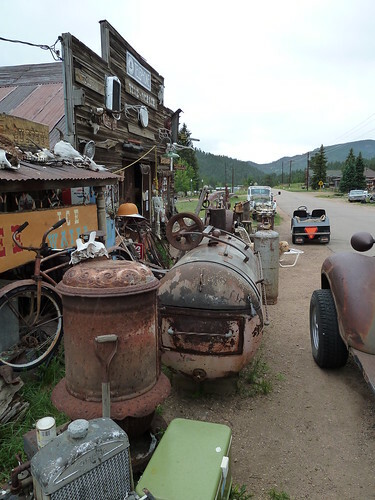 I’m not on commission but a place as friendly, eccentric and picturesque as Guffey is a “must” see on the Trans Am. But in complete contrast Jeffrey City……! I’d probably guess that the population is nearer 50 now! 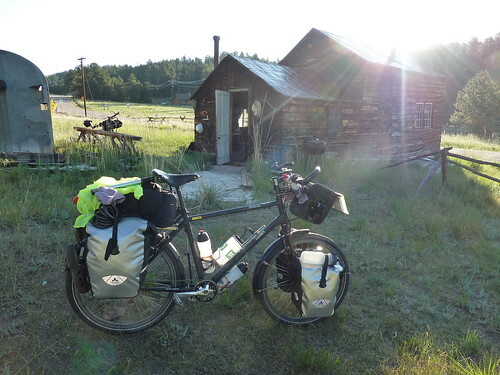 My Jeffrey City experience was something I’ll never forget…..
To get from Rawlins to Lander Wyoming or vice versa requires a monumental ride of 145 miles that very few could make. 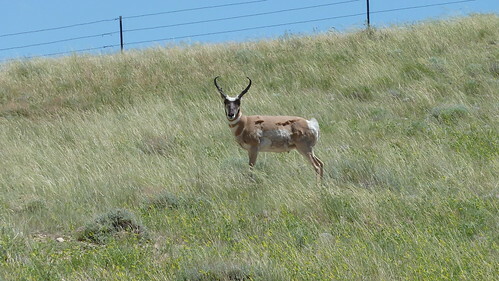 This then leaves you to the prey of the limited accommodation that exists on this section of the route with most people resorting to Jeffrey City as a rough half way point. 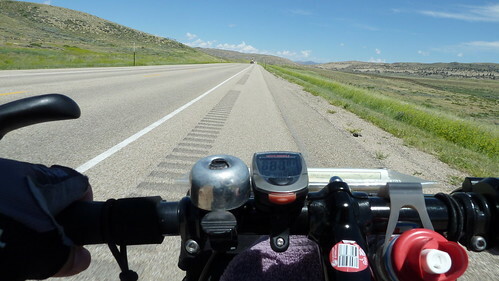 20 miles out of Jeffrey City we were hit with a bad omen, the sky was darkening rapidly, the wind speed started to pick up and what had been a picturesque sunny ride through a beautiful landscape started to deteriorate rapidly. Ahead in the distance lightning bolts were striking the ground; I watched as the ACA (Adventure Cycling Association) riders who we had caught up with were leaning their bikes into the storm force winds to avoid being blown off. Then the sleet started, but sleet coming in sideways at high speed feels like someone firing grains of rice at you from a gun, luxury compared to the pain of the marble sized hail stones that came next. Soaked through, travelling at 3mph our bedraggled group battled on knowing that our savoir, Jeffery City, was only 5 miles away! Up ahead Rob from the ACA group went down hard when the wind blew him off of the hard shoulder, the gravel rash was nasty. Eventually still fighting the storm we spotted the Motel sign, relief at last. Mmmm but this Motel looked closed and derelict, we cycled on down through this one street town until we arrived at the Split Rock Cafe, the only cafe or business in this whole sorry place. Before we could even enter the cafe a ferocious dumpy Rottweiler of a woman came out and glared at us, “Don’t park you bisickles against the winda”, welcome to Jeffrey city I thought! She obviously wasn’t a member of the tourist board. After “Parking Pretty” the six of us filed into the Cafe \ Bar and sat battered and bruised around a table where a more congenial , yet semi-deranged waitress presented us with menu’s. We later found out from other riders that the menu is a ruse, you can basically have what they’ve got, which can consist of one or two menu items if your lucky, depending on when the delivery truck has been! We must have arrived on delivery day, as the menu had it’s full gamut of deep fried potato products to chose from. 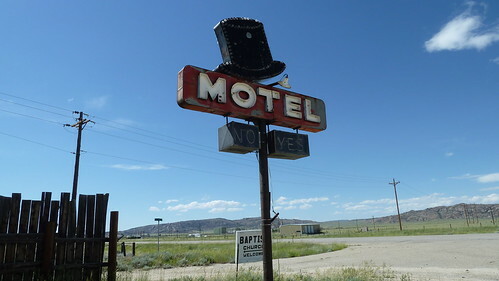 We found out that most of the other ACA riders had done the same as us and cycled passed thinking the Top Hat Motel was closed. But we all new that apart from the floor of the former Masonic Lodge or mosquito infested wild camping, the Top Hat was our only option. After much debate about his Scottish heritage and how he liked the Brits, he agreed on the ACA’s discounted rate and then fleeced us for $60, with that look of someone who knows he owns the only digs in town! He continued to talk at us and in whispered tones and told us about his secret missions he used to do for Uncle Sam and how during one of these missions a Fatwa was put on his head after he threatened a bunch of 'A' rabs that he would “Wipe his back side with the Koran”!! JT "was" obviously a delusioned nutter of the highest order and was more than likely a Uranium miner than a special agent for Uncle Sam! 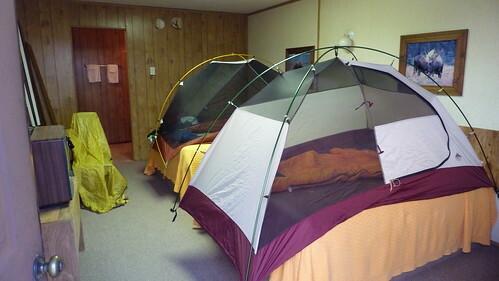 We were some of the lucky few that had a key to our room, the ACA girls, Bryn and Amber, had their room ceremoniously opened with a crow bar; not only that but they decided to pitch their tents on the beds to avoid the creepy crawlies that lived in the rooms. Our room had an en suite flood and bedding that was attached to the headboard with cobwebs, we did on a positive note have two TV’s, neither of which worked as they were analogue and couldn’t pick up a digital signal! We survived the night but had to face the Split Rock Cafe one more time, to eat breakfast before the long ride to Lander. Now you would think that a large group of cyclists descending on your town and probably doubling the takings for your cafe that week, would put a smile on your face and step up your customer service to a new level. But no, we found out the Rottweiler with the social graces of a slug was still intent on yelling at people and my three attempts at a “Good Morning” were dismissed with not even an acknowledgment. Her finally was to try and bill anyone with an electronic gadget on the table an extra $5 for use of her WiFi. There was a mass exodus from the cafe and I can guarantee that no one tipped the staff or paid for WiFi. This town had been a total exception to the normal friendly way Trans Am cyclists get received in Americas small towns and all those that survive this section on the route will have earned their right of passage. 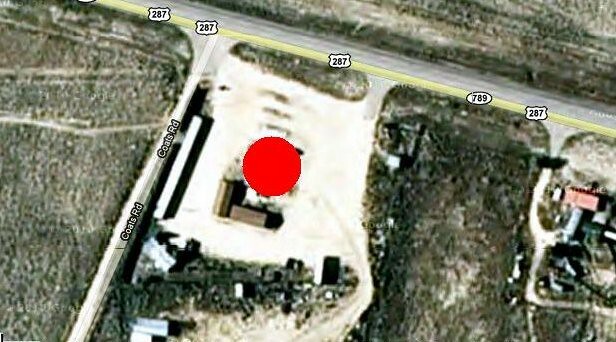 As we pedalled off the mosquitoes swarmed and attacked in force, tumble weeds skitted across the road and I wondered how long it would be before this God forsaken place turned into another deserted ghost town. Maybe it’s the Uranium in the water that makes the locals such a “happy” crowd!!! Mate - what a contrast! Wish I could share these adventures! Last year we camped there on the only plot of grass in town, which appeared to be the lawn of the Catholic "church." Around 9:30 pm, after most had gone to sleep in their tents, a mean old cowboy pulled up in his truck and asked "how much ya reckon I oughtta charge ya for campin' on my properta?" When we tried to bargain down from his suggestion of $20 per person, he told us to F off and get movin' (his return with a shotgun was implied). SO we had to wake everybody up and move tents across the highway to an abandoned parking lot and universal epicenter of mosquitoes. I hate that place. Very nice post, Stu! Apparently, you meet some very interesting people!! you forgot to mention the names of the two dogs of Bill: "Harley" and "Davidson". His previous dog, Lars, is buried in a pet grave near the prisoner wagon. A coach and horses for taking people to Jail Al. 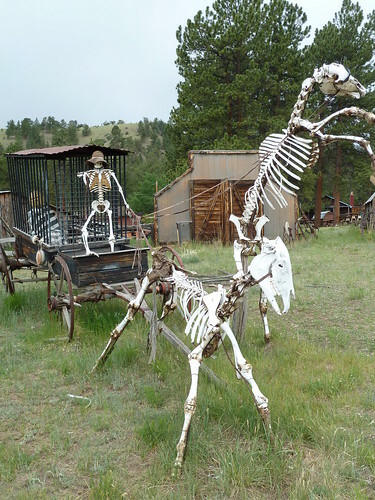 The weird thing being the coachman, the prisoner and the horses were all skeletons!! !